It was so much fun that two years ago, I created this challenge so that YOU can join me! 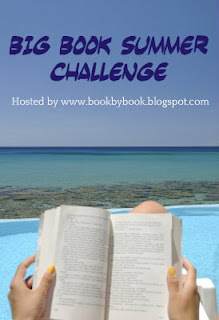 Here is my post from last year's Big Book Summer Challenge. And here it is Memorial Day weekend again and the official start of summer 2014. So join in the fun! The challenge will run from Memorial Day weekend (May 24-26 this year) through Labor Day weekend (Labor Day is September 1 this year). Sign up on the links list below or on the 2014 Big Book Summer Challenge page. Thanks to Tanya from Mom's Small Victories for leading me to this! Yay, so glad you joined Lisa. Happy reading! Woohoo - I've actually knocked out two big books this summer: What Is The What (http://litandlife.blogspot.com/2014/08/what-is-what-by-dave-eggers.html) and P. S. I Love You (http://litandlife.blogspot.com/2014/07/ps-i-love-you-by-cecelia-ahern.html).